I’m not a person who rereads books. There are a few I will revisit, but in general, when I finish a book, I never pick it up again. I like to move on to the next thing. Unfortunately, that isn’t really possible when I’m writing a book. Rereading is a integral part of editing and revision, such that by the time I’m done writing a book, I’ve read it dozens of times. It’s tiresome and confusing. After a while, it’s difficult to judge the quality of a book you’ve read a hundred times as you rewrite it. Nothing is new, nothing is surprising, and I can’t help wondering if it there will be anything delightful left in the thing for readers. This is a critical part in the writing process when you really have to rely on beta readers and your editor to talk you out of burning the whole thing and moving to Nepal. I’m lucky to have people in my life that fill those roles so perfectly and that they are so different from each other. Jennifer, my editor, takes the carrot-stick-carrot approach. She reads the whole book and tells me she likes it. Then she sends me page after page of edits in red, red, red ink. Then she tells me it’s the best thing she’s read all month and that she loves working with me. I’m fairly certain she says that to all her clients, but it feels nice when she says it anyway. Kristin, who has actually partnered with me on stories in the past, has a different approach, one that is truly hers and that I haven’t seen mentioned in any of the writing/editing books that I’ve read. Kristin simply writes snake-men into any scene she finds lacking. For example, if I write a scene that takes place during dinner and Kristin finds it doesn’t really move the story forward, she will simply rewrite the scene so that the diners are attacked by snake-men. If she’s feeling lazy, she just adds a note to the text that simply says “needs more snake-men.” This is a unique approach to developmental editing. Sometimes it results in yelling. Nonetheless, all three of them are an important part of me finishing a book, which I’m trying to do now, which is what brings me back to rereading. I’m doing a lot of that. I did a lot of it before I left for Maine, and while I was in Maine, and now that I’m back from Maine. So, I’ve decided for the buff and polish phase, before I send it out to Michele and Kristin and Jennifer for their opinions, I will be rewriting it backwards. I’m starting with the last chapter and working back to chapter one until it’s all shiny like a new penny. It seems like a good plan and a way to look at the book differently. Let’s hope it works. I don’t like major revisions. I don’t mind minor revisions, buffing and polishing, but rewriting the bulk of a book is zero fun. It always happens that at the end of the love affair that is the first draft, I have to slog through a major rewrite. When it gets to the point that I’m sorting through all the pens in the house and making big decisions like keep-or-go for the pen we got from the car dealership, it’s time to go to Maine. My friend Michele lives in Maine. She really likes it there in spite of the snow looking like this. 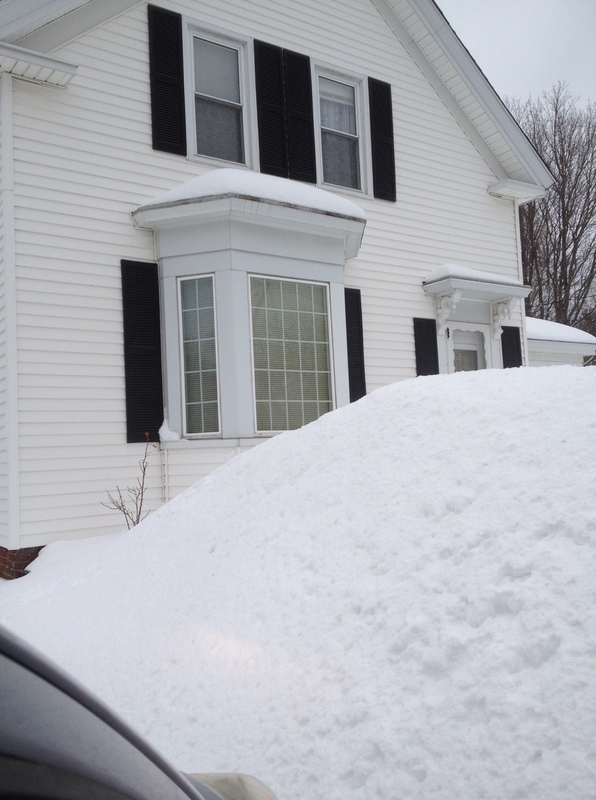 I don’t like snow, so when I’m in Maine, I stay indoors, snuggled under a blanket, typing. I get more done in a week in Maine, in February, than I do in a month at home. But I need coffee, lots and lots of coffee. Michele doesn’t drink coffee, or any caffeine, which boggles the mind. Because she’s a good friend and understands my needs, Michele immediately wisked me away to Coffee by Design to buy coffee. Thus fortified we headed to her house to work. Michele, for some reason, doesn’t mind going out in the snow and so on occasion, she insisted on leaving the house. There were frequent trips to The Hen House Cafe to what surely must be the best breakfast in the north east. One of these trips, resulted in us also going to Aroma Joe’s in Sanford. This particular Aroma Joe’s has a vault. The vault was where I finished my major rewrites. I have super fond memories of this vault. 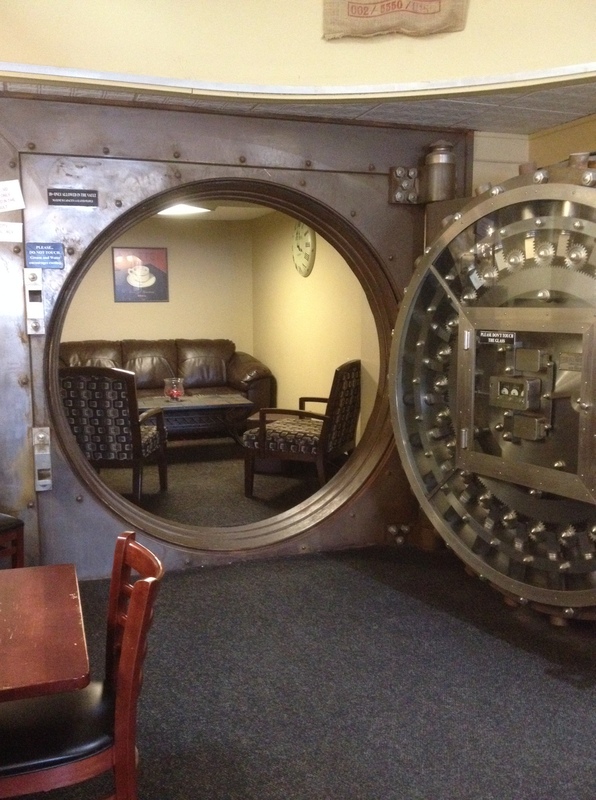 The vault in Aroma Joe’s in Sanford. So the major rewrites are done, buffing and polishing is proceeding. My book, One Big Beautiful Thing, is being featured on Monday February 10th 2014 at eBookSoda, a new readers’ site where they’ll send you ebook recommendations tailored to your taste. Check them out at www.ebooksoda.com. My husband is a firefighter. If you tell me something in my house is prone to catching fire, it’s not going to be in my house for very long. Out went the Cuisinart and thus began my journey to better, safer coffee. As it turns out, people have strong opinions about coffee. Many people suggested a Keurig, but I quickly realized that wasn’t a good option for me for a variety of reasons. The first is that I drink six, five ounce cups of coffee every morning one right after the other. The second is that I’ve been grinding my own beans for a long time, so I’m used to paying a premium for coffee, but I’m not used to paying double what I pay now for freshly roasted beans just to have prepackaged ground coffee in those little plastic cups. They are too expensive and they produce a lot of landfill waste. As for the reusable Keurig cups, that’s a better option, but grinding beans and filling one of those six times every morning doesn’t sound very convenient. I looked at French presses, but I don’t like the sludge factor. I like a clean, bright cup of coffee and the French press produces a murky, thick cup of coffee. I know a lot of people who love them, but I don’t. 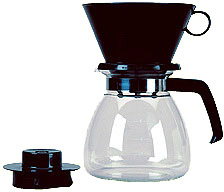 I considered another drip coffee maker, one that didn’t catch fire, but after doing so much coffee research, I realized that most drip coffee makers don’t get the water hot enough for a really great cup of coffee. Since I was getting high quality, locally roasted beans from places like Beanetics in Annandale and Catoctin Coffee at the Leesburg Farmer’s Market, it seemed like a good time to up my coffee making game. After much reading about coffee and watching many YouTube videos on how to make coffee, I settled on the Melitta pour over pictured above. It produces a clean, bright cup of coffee just like I like. Using the Melitta, I often drink coffee black now rather than adding cream. 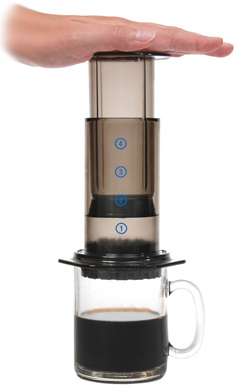 Colin, however, prefers the AeroPress pictured above. He is a big fan of chicory blended coffee and prefers his coffee with a lot of milk, so the espresso-like concentrate that the AeroPress creates is perfect for his morning routine. 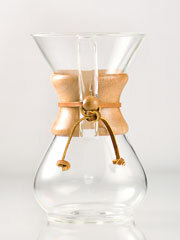 Kristin settled on a beautiful Chemex like the one pictured below. Like the Melitta, it produces a clean, bright cup of coffee, but it’s also super pretty. Whatever your coffee preferences, I encourage you to try some of the methods I’ve mentioned. I was surprised by the difference and I don’t think I have a particularly sensitive sense of taste. There is a lot of wonderful coffee out there to be enjoyed. I want to try it all.